Twitmoko.com is an application for sending and receiving updates from your social sites — facebook, twitter, friendster — which is part of mysandbox.com portal, which is also a product / service of Smart Communications. In short, twitmoko.com is another service provided by Smart Communications in Philippines for updating your twitter, facebook, and friendster. To register for the twitmoko / Smart Tweets service, simply go to twitmoko.com website or sandbox web portal. So it’s Php 2.50 for activation. Then, Php 2.50 for following people. I believe this is more of which people you follow you want to receive updates from. I’m not sure of Php 2.50 is per person you are going to activate for following. How do I select friends to follow on text? The service allows you to follow up to 10 friends on your phone. So pick ’em wisely! You will only receive the status updates of friends you are following.Remember, you can always manage who you want to follow on mobile right here on Sandbox! Just login here at www.mysandbox.com/nets. » Somebody writes on your WALL or makes a COMMENT about your status or replies to your Tweet. » Your selected friends updated their status. » By default, you will receive all messages posted on your Facebook wall and messages sent to your Facebook Inbox. If you want to select the type of post you get, see the Other Helpful Keywords below on how to deactivate Phone Comments, Wall and Inbox. I believe the above rates is for the updates you will receive from your phone. So the minimum rate is Php 5 per social site for every 30 updates. Then, Php 20 per social site for 120 updates. Then, Php 1.00 per update you will send to the social sites of your choice. Hey how do I update my Status by Text? Easy! Just text the keyword and the message. Remember to stay within the character limits so you don’t get errors! » Remember to stay within the character limits so you don’t get errors! That’s it! After sending the text, your status will be updated online! Cool right? For the complete list of instructions, keywords and rates on how to use twitmoko.com / Smart Tweets, simply go to twitmoko.com website. Which Telco offers the most reasonable twitter/facebook update via SMS service? 1. Sun Alertz is Sun Cellular’s Update to Social network sites — Twitter and Facebook — service. I believe Sun Cellular was the first to be able to provide a ‘reliable’ twitter/facebook updates via SMS among the TELCOS here in the Philippines. I had tried it before. I guess for a day or two, and it worked fine on me. Following are Sun Alertz rates. Their packages are unlimited — unlimited send and receive of updates. Please check their Sun Alertz site, sunalertz.com, on how to use it. 2. Globe Mobile Tweet is Globe’s version of updating your social network site, twitter, service. Before, Globe Mobile Tweet, they had the Globe UPD8 which I had tried, and it did not work on me. With Globe UPD8, it was P2.50/update. So the Globe UPD8 was a total fail. But now they are back with Globe Mobile Tweet which is provided by xurpas.com. Their unlitweet is P20/day, unlimited updating of tweets but only 10 free dm/mentions send to your mobile phone. To register, text TWEET REG <Twitter ID> <password> to 2363 for FREE. To send a tweet, text TWEET <message> to 2363. P1/txt. To mention a Twitter user, text TWEET @<Twitter ID> <message> to 2363. P1/txt. To send a direct message, text D <Twitter ID> <message> to 2363. P1/txt. To subscribe to your direct messages and mentions, text @<your Twitter ID> to 2363. P1/txt. To subscribe to a Twitter user via SMS, txt FOLLOW <Twitter ID> to 2363. P1/txt. To get your last 150+ tweets, txt FEED to 2363. P2.50/txt. Please check Xurpas FAQ or Globe’s for more details of Globe Mobile Tweet. 3. 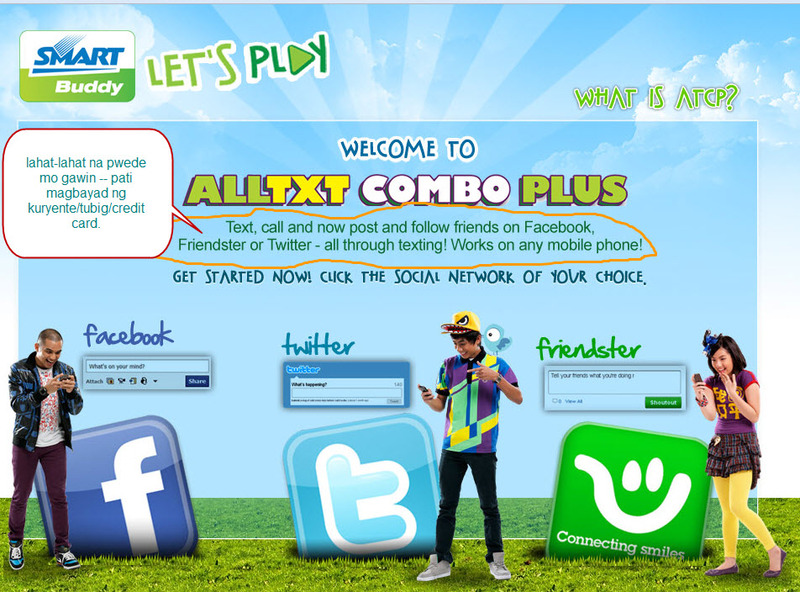 AllTxt Combo Plus is Smart’s version which lets you update facebook, twitter, and also friendster via SMS. I believe Smart is the latest to have a service to update your twitter and facebook. I haven’t tried this because I have never been a Smart subscriber so I could not tell if it is reliable or not. Following are the rates lifted from their site. 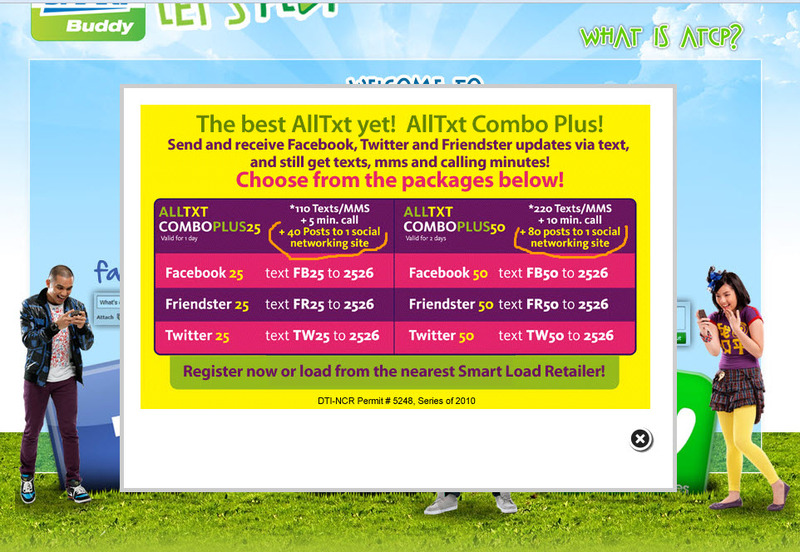 All Txt Combo Plus is an exclusive offer to all Buddy subscribers nationwide. All Txt Combo Plus is a bundled offering where in sms, mms, voice calls and texts to social networks (Facebook, Friendster and Twitter) are bundled into one package. If I were to choose among the 3, I would go for Sun Alertz if the rates is just the basis. I believe they offer the best offer. P15 for unlimited sending and receiving of updates, compared to Globe’s P20 unlimited but only for sending you updates, not receiving. 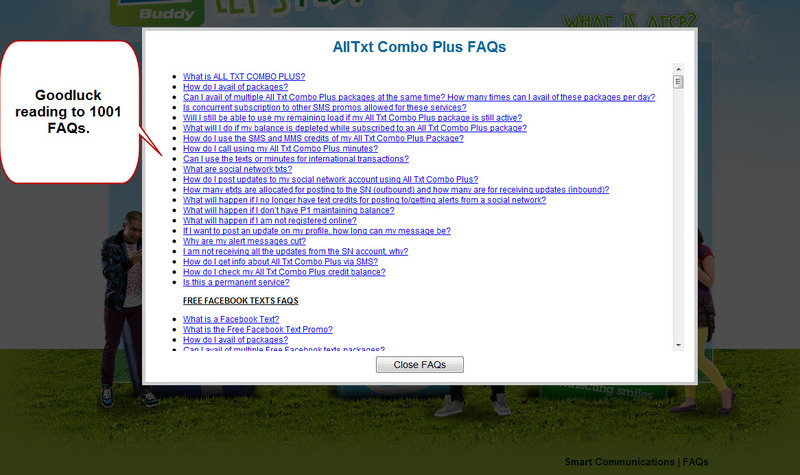 And, Smart’s AllTxt Combo Plus does not offer any unlimited. The downside of this is that the update to twitter/facebook service is a separate service that you have to pay separately. What I mean is that if I subscribe to unlitxt package, I cannot use it to update my twitter/facebook. I still need to subscribe to another service. Comments Off on Which Telco offers the most reasonable twitter/facebook update via SMS service? 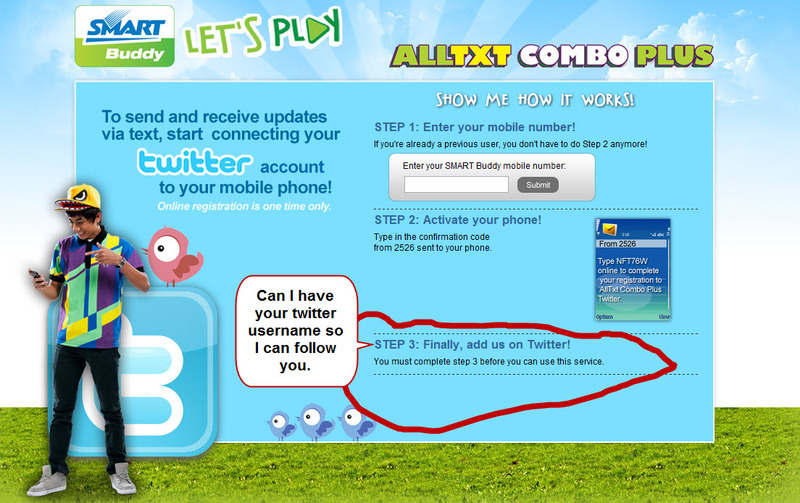 Of all the ‘names’ Smart could give to their service for updating social sites, they have to call it AllTxt Combo Plus. While I would dream to be telling my friends that I update my twitter via ubertwitter. Smart think its cool for the user to be telling their friends, “Oh my, I update twitter via AllTxt Combo Plus. In fairness, their website is fab (so web 2.000000) — alltxtcomboplus.com.ph. But after the fab looking, goodluck on how to register to it. They’re not yet contented with their very smart branding/product naming/whatever-you-call-it, they even have to make registering for it too complicated. I just second the motion the comment I read from techpinas, ikr. The 'follow us' has to be included in the steps? To make it easier for you, I copy and pasted the FAQ at scribd so you can dowload a pdf file of it. So if you are bored, you can read it. So following are the very INNOVATIVE packages of Smart’s AllTxt Combo Plus service. For Php50 packages, just change the 25 to 50. Enough, the command keys making me bleed. So if you want to update 40 posts to each 3 social sites — you have to pay P75/day. Good deal? It took time for me to post about Globe Mobile Tweet. It’s been here for awhile. But I have my own personal drama and issues in life. Globe has Globe UPD8 before their Globe Mobile Tweet service. And, prior to branding their Mobile Tweet to Globe Mobile Tweet, I still remember they also use Twitter4J. Or, maybe Xurpas customized the Twitter4J to Globe Mobile Tweet now. To use Globe Mobile Tweet, following is the instructions I lifted from Xurpas.com FAQ site. Globe site has also their FAQ site for this service but I prefer xurpas.com FAQ since it is more detailed. What is Mobile Tweet?Mobile Tweet is a service that allows you to send and receive Twitter messages for as low as P1/txt. You can also enjoy unlimited posting of tweets for only P20/day, which includes 10 free direct messages and/or mentions. You may also download your last 150+ tweets or direct messages at P2.50/MMS. This service is open to all Globe and TM subscribers. How can I use Mobile Tweet? To get your last 150+ DMs & mentions, txt DM to 2363. P2.50/txt. To avail of Unlitweet, txt UNLITWEET to 2363. P20/day. What is Unlitweet?Unlitweet allows Twitter users to send unlimited tweets within 24 hours for only P20.00. Unlitweet users can also enjoy 10 free direct messages and/or mentions. To avail, text UNLITWEET to 2363. P20/day. I am already subscribed to my direct messages and mentions. If I avail of Unlitweet, will I still be able to enjoy the 10 free direct messages and/or mentions that go with it? Yes. Upon confirmation of your Unlitweet subscription, the first 10 direct messages and/or mentions you receive within the 24-hour period will be free of charge. How will I know when my Unlitweet will expire? When you text UNLITWEET to 2363, you will receive a confirmation message indicating the date and time of expiration of your subscription. You will also be sent a reminder via SMS before your subscription expires. I am already registered to Mobile Tweet but I can’t seem to send a direct message to a friend. What should I do?Make sure you are following a friend first before sending a direct message. To follow a Twitter user via SMS, txt FOLLOW <Twitter ID> to 2363. P1/txt. I have been trying to download all my 150+ tweets or direct messages and/or mentions, why haven’t I received a reply?Downloading your last 150+ tweets or direct messages and/or is done via MMS. Make sure your phone’s MMS settings are configured before using this command. Do I need to be a registered Twitter user before I can use the service? Yes, you need to have your own Twitter ID before you can use Mobile Tweet. Visit http://www.twitter.com to open an account if you do not have one yet. Can I register to Unlitweet even if I have a previous Unlitweet subscription? No, you cannot register to Unlitweet until your current subscription has expired. How can I know more about the service? To get more information about the service, text TWEET to 2363 for free. You will also be given a list of commands that you can text to download or subscribe to Mobile Tweet functions. I have tried their service when they officially launched it. And, it’s actually reliable. Though, I just hate it that they have to insert some ‘ads’ to the tweets that I received, which I paid for. But I guess, we have to understand that it’s business. I actually like their P2.50/MMS which contains 150 tweets from your timeline. Please note MMS here is not pictures, but it means 150 tweets in one MMS. Please go to http://tweetitow.com for a more updated information. @tweetitow is a 2-way SMS-based twitter application, which is the true essence of Twitter. You can do 2 things with @tweetitow — 1. send twitter upates and 2. receive twitter updates straight from your mobile phone. It has 3 gateway numbers for Globe, Smart, and Sun users. 1. Create an account in twitter. Remember your correct log-in IDs – username and password. 3. 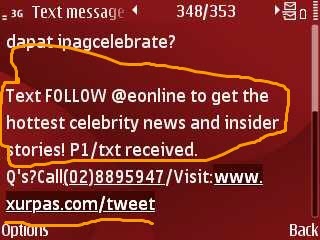 You can receive confirmation via text and mention in your twitter timeline. Once you are done with these 3 steps, you can then start texting or sending as SMS your tweets. You can compose your tweet just like how you text your friends. To mention another twitter user in your tweet, simply insert the username like this: Tomorrow I will marry @britneyspears. To send a direct message (DM) to another twitter user, simply put a ‘d’ at the start followed by the username you want to send the DM. You can do it like this: d @username this is a secret message. 1. Send /on to any gateway numbers to go online. Once you are online, you can then receive your DMs and mentions. /on -> To go online and start receiving updates — mentions and DMs. /off -> To go offline. This means you will stop receiving updates. /credits -> To check how many credits you still have. /follow @user1 @user2 @user3 up to 8 users -> To start receiving updates from the user you follow. At the start, you will only receive mentions and DMs updates. If you want to receive tweet updates from a particular twitter user, you need to activate receiving updates from them. Example format, /follow @tweetitow. /leave @user -> To stop receiving updates from a particular activated user. /followstats -> To get a list of the twitter users you activated to receive updates from your phone. /hold -> Hold sms updates. Similar to the command /off except that the settings and user you activate to receive updates from the last session are keep. /resume -> To resume your session, and receive updates again from your phone. /whoami -> To verify what twitter account you registered to T2. /give @user -> To give another @tweetitow registered user some of your credits. Giving is sharing is loving. /whatsnew -> To retrieve the 5 recent updates (from the last 24 hours) from any of the people you follow (including those you did not turn on to receive updates from your phone). To receive another 5 recent updates, simply send /whatsnew again — the 5 older tweet updates will be sent to your phone. /whatsnew @user -> To retrieve the 5 recent updates of a user from the last 24 hours. Send the command key to any of the gateway numbers for execution. For a more detailed steps and information, please check the help page of tweetitow.com. If you need more help, please message @owrange or @tweetitow. Based on their gladlyCode blog, they open their twitter/plurk update via SMS on October 29, 2009. But before that, they were already servicing Singapore and Malaysia which started around August 4, 2009 (Singapore started) based on their very first tweet. For Malaysia, they started September 2, 2009. They are based in Singapore based on one of their tweet updates. They have 3 gateway numbers — for Singapore, Malaysya, and Philippines — where you can send your SMS. To use their SMS-based Twitter/Plurk application, simply go to their gladlyCast website. For their Philippine gateway, they have this number +63 929 106 0211, which looks like a Smart number, specifically a Smart Bro number — which is for their prepaid internet. because Smart is known to have biggest number of mobile subscribers among the 3 big Telco in Philippines — a no-brainer decision. because Sun Cellular has Sun Alertz and Globe has UPD8 while Smart has almost non-existent SMS-support for twitter. The nice thing about gladlyCast is that they provide support for Plurk which is also quite popular in Philippines. Philippines, especially Smart users, go try gladlycast. I tried it and it works. But for homegrown Philippine 2-way SMS twitter update, check @tweetitow. The main and original purpose of Twitter is micro blogging via SMS thus the limit of 140 characters. I believe at the early stage of Twitter, anybody around the world can send updates via text but of course they have to pay international text rates. Then, somewhere down the road, it was stopped. Outside USA, few countries can tweet 2-way (send and receive updates) via SMS because of the huge charge of international SMS rates. They used to service Canada but was cut off some time in November last year as costs were too huge. But in February, 2009, the 2-way SMS tweet update was restored in Canada by partnering with Bell Mobility, a Canadian based network provider. UK got its 2-way SMS twitter update via Vodafone last March2, 2009. Then in July, 2009, Twitter partnered with O2, another UK-based mobile network provider, to also provider 2-way SMS twitter update in UK. Then the latest country to have this 2-way SMS twitter update is India. Last October 14, 2009 when they announced in their blog that 2-way SMS twitter update is available in India via Bharti Airtel. This is said to be the Twitter’s first entrance to the Asian market. But long before Twitter 2-way SMS update came to India, or even before Canada has their own local-based 2-way SMS twitter update, Twitter update via SMS had long time started in Philippines. Following are fast facts of updating Twitter via SMS in Philippines. 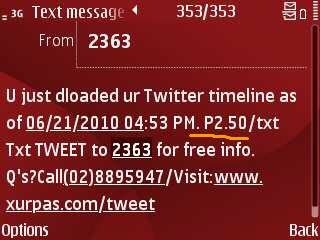 Canada, the first country to have local-based SMS twitter update started last February, 2009, but here in Philippines it started in December, 2007 via phTwitters.com. As indicated in its twitter account, they officially started 5PM December, 29, 2007. Though, it was only a one-way SMS update but nevertheless, it shows that local-based SMS twitter update started very early in Philippine, one year ahead c0mpared to Canada. Then, Globe has their Twitter UPD8, which according to their site was launched last August, 26, 2008. Though, I’d like to add that it is unknown if this really works reliably. Isip.ph then reached its 1,000 users within just 2 months from it started. This is based on a tweet posted by Erick Kalugdan. Smart launched their Twitter Mobile, like a week after isip.ph, on May 31, 2009. I cannot seem to find an official post in Smart website about this. My only source is rickspot.com blog. Basing on the blog, it looks like the Twitter Mobile of Smart is only one-way SMS twitter update. 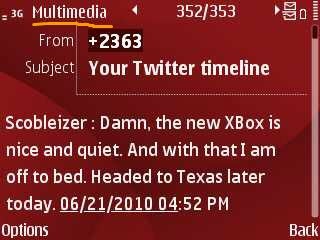 Then, the last player to be added to the SMS-Based Tweeting Update application here in Philippines is @tweetitow which came in July 31, 2009. But though it is late, it catches up by being able to provide a 2-way SMS based twitter update. But then still, it started months earlier than Bharti Airtel of India. Even the latest player in Philippines is still ahead of the supposedly first entrance to Asia of SMS-based Twitter via India. Though, phTwitters already stopped providing service sometime in the 2nd quarter of 2009, and Isip.ph stopped accepting new registration of users but service still continues to the registered users, but still undeniably Philippines can rule the SMS-based tweeting update. And, we did came first to innovate a local-based SMS twitter update outside US, and it was not even by a big mobile network provider.Can you imagine the possibilities of our Filipino brains? This shows how innovative we are.